. Vehicles used in Winter . There are many things to keep us warm in winter, most of them are kigo. Here is a growing list of them. Please add the kigo of your region ! 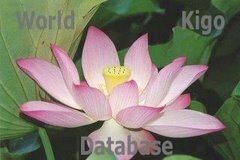 Click on the hyperlinks for more detailed information in the World Kigo Database. A wooden frame is covered with white washi paper. compared to a sliding door in winter . 臥す間, literally, a room to lie down, bedroom. kamibusuma 紙衾 (かみぶすま) futon from paper, the inside is padded with cotton. This was used by poor people, using old sliding doors from temples, which were discarded in late autumn. ... Tentokuji 天德寺（てんとくじ）"like in the tempel Tentoku-Ji"
Cloths are changed in spring and in early winter to prepare for the hot and cold season. The date for winter was the first of october according to the Asian lunar calendar. 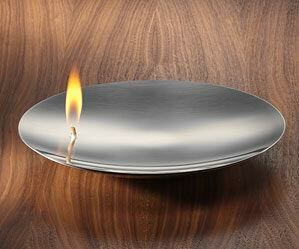 Sometimes medicinal herbs are put in a large water pot and this is placed on a stove. Nowadays we also have electircal appliances. In former times, the cut-off leaves of daikon radish or turnips were dried and put into the bathwater. It is said to help when the body feels cool (hieshoo) and for old people. ..... nijuu mawashi 二重回し (にじゅうまわし) . . . CLICK here for Photos ! ..... hifu 被布 (ひふ) padded overcoat worn by small children and women . . . CLICK here for Photos !
. nagezukin 投頭巾 headgear for winter rituals .
. okoso zukin 御高祖頭巾 hood for winter . Okosozukin 御髙祖頭巾（おこそずきん / 御高祖頭巾）hood made from a long shawl, like St. Nichiren used to wear. momohiki 股引 (ももひき) long underpants "riding on your thighs"
. kakumaki ningyoo 角巻き人形 dolls with a square scarf . 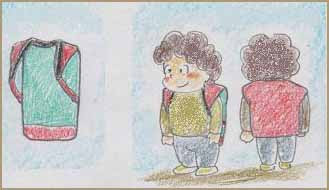 A special back warmer from Tohoku is like a padded rucksack, without any sleaves. It is said to keep the housewifes warm while leaving the arms free for the housework.
. kawabaori 皮羽織 leather haori coat . Especially used by old people and small children in the Edo period and later. In the Northern parts of Japan, everyone used it. Because it has no sleeves, you can easily do your daily chores with it, outside and inside the usually cold farm houses. monpe もんぺ cotton trousers . Mompe. Often blue with fine patterns, still used by farm wifes nowadays. In winter they are quilted. made from cow leather, with iron spikes on the bottom. They are used by the bear hunters (matagi) in winter to walk through the forest. With a special warm cover for the toes. 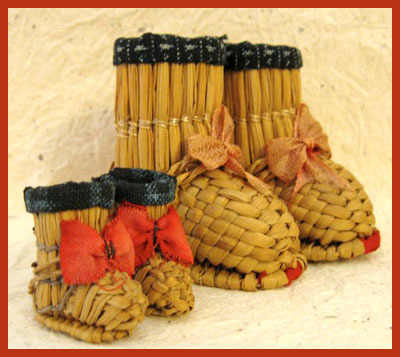 yukifumi 雪踏 (ゆきふみ)"stepping on snow"
fumidawara 踏俵（ふみだわら）special boots to make a way for walking in snowy counry. The most important is the hodgepodge, nabe　鍋　なべもの that comes in many varieties. soup eaten in the dark with candlelight, shared with good friends. Sometimes they had to guess the kind and number of ingredients in the dark. This captures the chill of an early spring day through the color of the woman's scarf. It makes one wonder if the color is not indicative of the woman's age, looks, and even character. 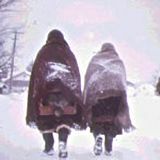 Erimaki long and wide mufflers were often worn by ill people and the elderly. 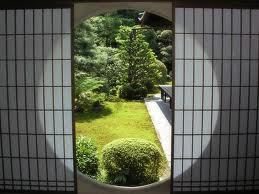 nokoru samusa is a kigo for early spring. hues of light yellow, green and blue .
. ajisai ya katabira doki no usu-asagi . I saw your wonderful site. Please link to this site ! Come to me night after night. . .
Fujiwara no Maro, the Master of the Capital Offices. nekoma shoji "with a space for the cat"
nekoma shouji　猫間障子 / Also *magoshouji 孫障子. A small sliding panel set within a standard size screen *shouji 障子that slides left and right or up and down to allow light and air into a room. Before the late 19c, nekoma shouji were used in place of glass. a story about a priest and Fudo Myo-O! Nobusuma 野衾 （のぶすま）"wild quilt", "wild blanket"
Sometimes depicted as a flying squirrel, sometimes as a bat.